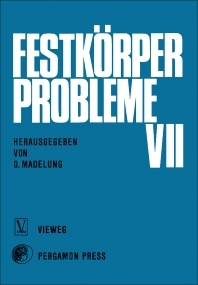 Festkorper Probleme VII covers papers of the European Meeting of the IEEE about Semiconductor Device Research. The book includes papers about the advances in band structures investigations using optical techniques; some problems in the physics of power rectifiers and thyristors; the surface properties of thermally oxidized silicon; and the amplification of acoustic waves at microwave frequencies. The text also presents papers about active thin film devices, optoelectronic devices, and negative conductance in semiconductors. Electrical engineers will find the book invaluable.